Friedrich Nietzsche (1844-1900) was a German philosopher who was also highly active in the arts, writing both music and poetry. He wrote a number of extremely important works dealing with the nature of philosophy and morality as well as cultural criticism. He is credited with the creation of a number of influential ideas, in particular that of life-affirmation, in which the objectivity and value of truth are questioned, even at the expense of social norms. His personal life was sometimes unhappy, and he suffered a serious breakdown at one point. 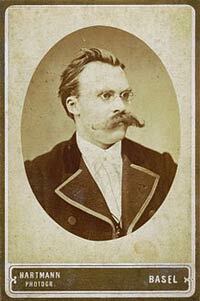 Nietzsche was born in the town of Rocken in Saxony on October 15, 1844. His father, like his grandfather before him, was a minister in the Lutheran church. After receiving a general education, Friedrich went to the universities of Leipzig and Bonn to study classics. He proved to have such a brilliant mind that before he had reached the age of 25, he had been employed by the Swiss university of Basel as a professor. However, the writings of Arthur Schopenhauer influenced him greatly, stating as they did that life was both painful and godless. Nietzsche, though believing that humans should make the most of their lives, turned his back on society to live a solitary existence. In the late 1860s, Nietzsche met the composer Richard Wagner and was impressed by the vast scale of his operas. The two became friends, but the friendship came under strain in 1888 when Nietzsche wrote a book which was highly critical of him. In the meantime, he had written the first of one of his most recognized philosophical works – The Birth of Tragedy, published in 1872. In this work, Nietzsche set out his belief that classical Greek culture could best be explained as the result of the struggle between Dionysian and the Apollonian forces, setting order and beauty against the need to pull things apart to see the reality beneath. Nietzsche was violently opposed to religion, stating boldly that “God is dead.” This phrase formed a key part of his best known work, Thus Spake Zarathustra, which took him almost a decade to complete and finally being finished in 1892. Despite its honored place in today’s list of acknowledged great philosophical works, it was not particularly successful on its original release. It was, however, given a boost in 1896 when Richard Strauss’s tone poem based on Nietzsche’s work, Also Sprach Zarathustra, was composed. The philosopher had also considered morality’s origins in two books written in the 1880s, in particular Beyond Good and Evil. Nietzsche’s work was interrupted suddenly in 1889 when he had a nervous breakdown. Although only 45, his health began what was to prove an unstoppable decline, perhaps exacerbated by the syphilis he was rumored to have contracted. Although by the end of the 1890s he had won international fame, his mental state was by then so bad that he was almost completely unaware of the fact. He died, adjudged insane, on August 25, 1900. Nevertheless, his writings resonated down through the years with personalities as diverse as George Bernard Shaw, Sigmund Freud, and even Adolf Hitler taking inspiration from his writings in formulating their own views.